Summary: Ukraine cannot afford to set an overly broad agenda for the OSCE. Kyiv must focus on a handful of opportunities that reinforce the vision of a Euro-Atlantic security community. Ukraine’s 2013 chairmanship of the Organization for Security and Cooperation in Europe (OSCE) presents Kyiv with a major opportunity to advance an agenda that benefits the entire Euro-Atlantic and Eurasian security community. Ukraine must make the most of this unparalleled opportunity and demonstrate its ability to lead and inspire others to achieve real progress on difficult problems. Ukraine will face unique challenges during its chairmanship stemming from its domestic politics, strained relations with some OSCE-participating states, and persistent negative perceptions of its record on citizens’ rights. Putting forward a complacent, status quo agenda or hindering the work of OSCE institutions or missions in any area will cede the spotlight to Ukraine’s critics at home and abroad. Ukraine will face predictably unpredictable crises, such as heightened tension between Moldova and the separatist region of Transnistria, expanded fighting in the disputed territory of Nagorno-Karabakh, and economic and political instability in Belarus. Kyiv should focus its agenda on a small handful of opportunities in each of the OSCE’s security dimensions—politico-military, economic, and human security—that directly reinforce the vision of a Euro-Atlantic security community. Success will require Ukraine to focus on building trust among OSCE participating states. Ukraine must leverage the resources of its own top diplomats and respected international experts while coordinating closely with both outgoing and incoming OSCE chairs. Prioritize Transnistria conflict resolution. Ukraine is a guarantor of the 5+2 process that seeks a negotiated settlement to the conflict between Moldova and Transnistria as well as Moldova’s largest neighbor. Kyiv is thus in a unique position to lobby all the stakeholders to embrace a common strategic framework. Ukrainian President Viktor Yanukovych should call upon counterparts from other OSCE-participating states to lend their support. Balance energy security and environmental impacts. Ukraine should put forward an energy security initiative that balances the present urgent need for an early-warning mechanism for energy issues under the OSCE umbrella with the linked challenges of energy efficiency and environmental protection. Kyiv should emphasize the long-term security implications of the region’s energy practices, including their impact on the environment and human development. Begin a process of historical reconciliation. Tensions over historical memory drive conflicts throughout the OSCE. Kyiv should spearhead an OSCE-wide historical reconciliation initiative that begins with a clear demonstration that it supports the process within Ukraine as well as with its neighbors, drawing on the successful experience of other OSCE participating states. After almost three years of discussion and debate, delegates from 35 states, representing both sides of the Cold War divide and three continents, reached agreement in the summer of 1975 on a set of basic principles meant to enhance security in Europe and the surrounding neighborhood. Their accomplishment, known as the Helsinki Final Act, remains the political foundation for cooperation on security among states of the Euro-Atlantic and Eurasian regions. Today, the successor to the Helsinki conference is the Organization for Security and Cooperation in Europe (OSCE), with 57 participating states. In 2013, Ukraine will take over the organization’s chairmanship. Carrying on the legacy of the Helsinki Final Act, the OSCE embodies a set of basic security principles grouped in three general “dimensions.” The first, politico-military security, guarantees the “sovereign equality” and “territorial integrity” of participating states while promoting the “peaceful settlement of disputes.” The second dimension promotes cooperation in the fields of economics, science and technology, and the environment on the basis of common projects and standards intended to reduce the likelihood of disputes driven by economic factors. The third and final dimension, human security, recognizes a set of basic rights to be enjoyed by citizens of regional states, including the right to travel, maintain family contacts, access education in native languages, freely access and disseminate information, and conduct cultural and commercial exchanges. The OSCE is, in essence, a platform for discussing major challenges of regional security and cooperation and resolving them within a framework of agreed principles. These principles are alive and well in the OSCE today. The organization itself has a limited executive staff attached to the Vienna-based secretariat plus three institutions: the Office for Democratic Institutions and Human Rights (ODIHR) in Warsaw, the Office of the Representative on Freedom of the Media in Vienna, and the Office of the High Commissioner on National Minorities in The Hague—all with a relatively high degree of flexibility and autonomy. (See appendix 1 for a complete OSCE organizational chart.) None of these institutions, though, is intended to substitute for the core function of the OSCE itself. While each participating state provides an ambassador to the OSCE to sit on the body’s permanent council, key decisions are always made by participating states’ governments and reconciled through negotiation at the highest levels. Thus the OSCE is, in essence, a platform for discussing major challenges of regional security and cooperation and resolving them within a framework of agreed upon principles. As a political agreement, the Helsinki Final Act imposed no formal, legally binding commitments. Likewise, the OSCE today has neither “legal personality” as an international actor nor any legal authority to permit or prohibit conduct by its participating states. Yet it is a serious mistake to dismiss the OSCE as weak or irrelevant. To the contrary, the OSCE is the only body that equally represents all 57 states of the Euro-Atlantic and Eurasian region and that is expressly charged with a mandate to deal with each dimension of the region’s shared security—dimensions that, as time and technology advance, are becoming ever more interlinked. Moreover, the OSCE can hardly be judged strong or weak on its own account. It represents the collective political will of participating states under the leadership of the chair. Thus, to label the OSCE weak is to criticize the engagement of the participating states or the diplomatic and leadership ability of the chair. The OSCE is no more and no less than a mirror of the overall state of relations among its participating states. With skillful diplomacy and a set of ambitious but clearly defined and realistic goals, the Ukrainian chair can help deliver significant progress on the security problems that plague not only Ukraine but also the OSCE as a whole. The silver lining in this situation is that the OSCE is inherently flexible and potentially as powerful as the collective determination of the region’s strongest actors. The OSCE chairmanship thus offers Ukraine a tremendous opportunity. Ukraine may be able to benefit from the elevated profile it will be afforded and take advantage of this prestigious position to conduct Euro-Atlantic and Eurasian diplomacy at the highest level. With skillful diplomacy and a set of ambitious but clearly defined and realistic goals, the Ukrainian chair can help deliver significant progress on the security problems that plague not only Ukraine but also the OSCE as a whole. If Ukraine fails to set high ambitions and invest all of its political capital in the 2013 chairmanship, then the year is certain to be worse than wasted, for both Ukraine and the OSCE. The dominant political tone will be critical of Ukraine, which will provoke time-consuming and purposeless conflict between the chairmanship and participating states, and the OSCE itself may be severely weakened. At a minimum, Ukraine’s chairmanship will bring significant international attention to Kyiv’s priorities and afford Ukraine the opportunity to be seen as a leader within the Euro-Atlantic/Eurasian community. And observers will undoubtedly measure Ukraine’s chairmanship against the successes and failures of the recent past. It should be Kyiv’s goal not only to compare favorably to past experiences but also to be a major initiator of activity and momentum instead of merely a passive steward of the Helsinki principles. Of course, not all precedents have been positive. Kazakhstan lobbied hard to take on the OSCE chairmanship in 2010, and its turn at the helm was widely seen as a vital opportunity for a post-Soviet nation to demonstrate thorough and impartial backing for the Helsinki principles, despite its own domestic challenges related to those very principles. Still, in many respects, the Kazakh chairmanship was a success. Kazakhstan certainly gained a higher profile on matters of Euro-Atlantic/Eurasian security as a result of its active and dynamic OSCE chairmanship, and the considerable resources it devoted to the Astana summit, marking thirty-five years since the Helsinki Final Act. The Astana summit was the first OSCE summit in eleven years in which participants debated—though ultimately rejected—an ambitious declaration aiming to increase the OSCE’s ability to tackle threats to its member states. And it succeeded especially with regard to crisis management, one of the major tests of diplomacy and leadership. Ukraine will doubtless face its own share of predictably unpredictable crises in its immediate neighborhood, if not farther afield. The conflict between neighboring Moldova and the Transnistria region, which seeks independence from Moldova, has cooled substantially since January, when a young Moldovan man was killed by Russian peacekeepers. But there is always the possibility of renewed tension over the perpetual sore points of constraints on free movement, language, education, and other basic rights denied to some citizens in the region. If the conflict did ratchet up, Ukraine would face dual responsibilities as both OSCE chair and a security guarantor in the OSCE-mediated 5+2 process, in which Transnistria, Moldova, Ukraine, Russia, and the OSCE, plus the United States and the EU as external observers, are seeking a negotiated settlement to the conflict. The scenarios leading to a potential political or security crisis in Belarus are myriad. It continues down the dangerous path of economic uncertainty mixed with political repression. Its difficulties have been exacerbated by the lingering impacts of the recent global financial crisis, Russia’s reluctance to continue subsidizing an unreliable client state, and the broader European economic slowdown. If a crisis broke out, Ukraine would be forced to respond, both because of the two countries’ physical proximity and cross-border economic, environmental, and family ties and because Ukraine and other OSCE participating states, such as Lithuania, Russia, and Poland, would likely have to absorb increased numbers of Belarusian emigrants. Kyiv has the opportunity to prove itself up to the task of Euro-Atlantic and Eurasian leadership in trying times. While the OSCE will not bear sole or even primary responsibility for managing these potential crises, participating states will look to Ukraine for careful and balanced leadership, with appropriately swift action when needed. Broader regional challenges, such as the impacts of Europe’s ongoing debt crisis or implications of Russia’s proposed Eurasian Economic Union, as well as the ebb and flow of domestic politics throughout the region, will all create a difficult backdrop for Ukraine’s chairmanship. Yet in all of this, Kyiv has the opportunity to prove itself up to the task of Euro-Atlantic and Eurasian leadership in trying times. In its OSCE chairmanship, Ukraine will face a set of unique challenges deriving from the country’s domestic politics, strained relations with some OSCE participating states, and persistent negative perceptions of Ukraine’s own record on commitments to the Helsinki principles. By far the most urgent and obvious challenge will be the problem of credibility on matters related to the human dimension. Convinced that the inherent dignity of the individual is at the core of comprehensive security,” summit participants declared, “we reiterate that human rights and fundamental freedoms are inalienable, and that their protection and promotion is our first responsibility. . . . We value the important role played by civil society and free media in helping us to ensure full respect for human rights, fundamental freedoms, democracy, including free and fair elections, and the rule of law. Likewise, in the run-up to Ukraine’s chairmanship, then Foreign Minister Kostyantyn Gryshchenko emphasized that promoting the “implementation of the existing commitments in the human dimension will be at the top of the Ukrainian Chairmanship’s agenda.”7 Failure to apply these same standards to Ukraine’s own domestic situation would be seen by other participating states as blatantly hypocritical. Finally, in the economic and environmental dimension, Ukraine’s strained political relations with Moscow could spill over into its OSCE chairmanship. Ukraine’s future economic stability and continued growth prospects depend on finding alternatives to imported natural gas from Russia, which Ukraine is forced to buy at higher than market prices. Yet Russia depends on the ability to sell natural gas to Central and Western Europe, using transit pipelines that run through Ukraine. Although Russia may eventually complete a transit pipeline to Europe dubbed South Stream, circumventing Ukraine via the Black Sea, in the meantime, Moscow and Kyiv are deadlocked and there is a very real risk of another 2009-style “gas war,” especially during the cold winter months that will bookend the Ukrainian chairmanship. The problem of weak and inconsistent property-rights protection in Ukraine has the potential to substantially undermine the public relations benefits of Ukraine’s chairmanship for potential investors and trade partners in the Euro- Atlantic and Eurasian neighborhood. Moreover, it may be difficult for Ukraine to promote best practices in trade and economic development for the Euro-Atlantic and Eurasian region when its own deeply flawed domestic property-rights regime, compromised judicial system, and widespread corrupt practices have resulted in years of predatory corporate raiding, including victimizing foreign investors.15 The problem of weak and inconsistent property-rights protection in Ukraine has the potential to substantially undermine the public relations benefits of Ukraine’s chairmanship for potential investors and trade partners in the Euro-Atlantic and Eurasian neighborhood. Balancing lofty commitments and aspirations with disappointing realities will be a recurring theme for the Ukrainian chairmanship in 2013. For each of the advantages and opportunities Ukraine may enjoy as OSCE chair, it will encounter difficulties due to well-known and long-standing shortcomings in Ukraine’s own domestic politics, institutional development, and foreign relations. Rather than interpreting criticism from other participating states as attempts to delegitimize Ukraine’s OSCE chairmanship, Kyiv should take advantage of the opportunity to demonstrate real leadership and progress. Ukraine’s success or failure in the chairmanship will depend to a large degree on the tools, traits, and ambitions it brings to the job. On the most fundamental level, Ukraine must devote and deploy adequate institutional resources to manage the complex work of coordinating among its own political leadership, the OSCE secretariat and missions, and participating states. But it will not be enough for Ukraine to simply avoid conflicts or challenges—it must instead anticipate these difficulties and marshal serious national resources under an ambitious and compelling vision of Euro-Atlantic and Eurasian security. Ukraine’s institutional resources as chair must first and foremost be focused on the OSCE Chairmanship Task Force, an organization formed in the capital city of whichever country holds the OSCE chairmanship to support and coordinate the chair’s activities. The task force should be headed by a respected senior diplomat, endowed with its own experts covering each of the OSCE’s three dimensions, and capable of addressing the chair’s major initiatives. In Ukraine’s case, it is essential to appoint a strong task force in Kyiv with direct and open access to the foreign minister, who in turn should enjoy privileged access to the president. The minister himself must also be prepared to spend considerable time on chairmanship responsibilities. 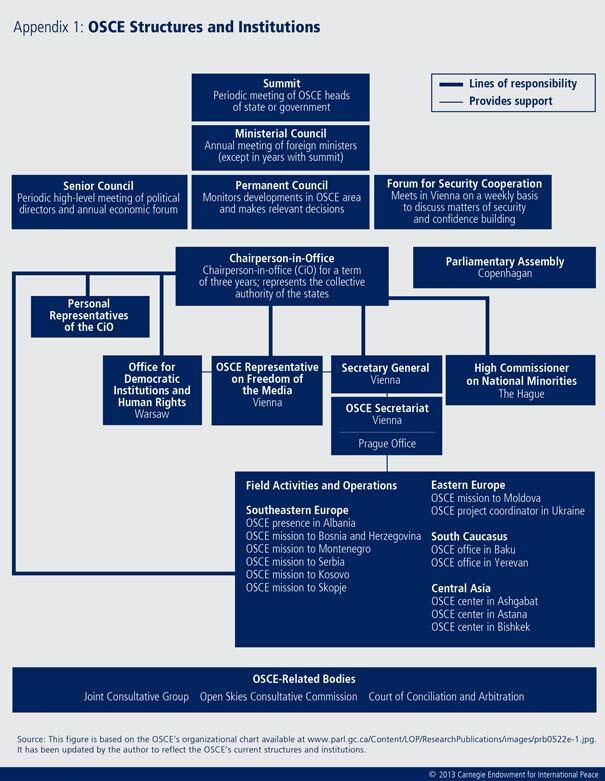 Ukraine, like past chairs, should designate liaison personnel in each of its major embassies in OSCE participating states, particularly in Washington, Brussels, and Moscow, as well as in Warsaw and The Hague, where OSCE institutions are located. Kyiv will also have the opportunity to appoint or reappoint special representatives on an array of issues. This is a chance for Ukraine to not only demonstrate its interest in areas such as gender equality, cybersecurity, or human trafficking but also enhance its own credibility by picking highly skilled individual experts who adhere to the highest professional standards and who, to the extent possible, represent a diversity of national and regional origins. By far the highest priority for Ukraine’s special representatives should be effectiveness. On urgent issues for Ukraine, such as the Transnistria conflict, it will be critical to designate a top-notch special representative who is able to garner respect from all parties and then endow him or her with sufficient resources. While Ukraine must take full responsibility for the success or failure of its chairmanship year, it is not alone in developing and implementing a productive agenda. Indeed, continuity with previous and upcoming chairmanships is institutionalized within the OSCE in the form of the so-called troika. Under this construct, the current chair is assisted by the previous and succeeding chairs. In 2013, Ukraine should coordinate closely with its troika partners, Ireland and Switzerland, each of which can offer something of unique value. As outgoing chair, Ireland will have up-to-date insights on the state of OSCE institutions and initiatives as well as fresh experience convening the December 2012 ministerial meeting in Dublin. The outgoing chair’s major initiatives could offer a core of continuity for Ukraine’s 2013 agenda. Coordinating with incoming 2014 chair Switzerland will be especially important, since it will help ensure followthrough and continuity for Ukraine’s initiatives. The Swiss have also begun to plan for their chairmanship well in advance and may be prepared to offer resources in support of Ukraine’s agenda in 2013 that can complement Ukraine’s own investments. Moreover, like Ukraine, Switzerland is neither an EU nor a NATO member, obviating the need for Switzerland to clear its activities with either alliance and underscoring its credibility as an honest broker. Serbia, which will hold the chairmanship in 2015, is likewise a non-bloc state and may find special resonance with Ukraine and Switzerland as all three look ahead to the OSCE’s 2015 Helsinki + 40 summit, which will mark the fortieth anniversary of the Helsinki Final Act. That summit is expected to attract significant international attention as participating states seek consensus on a major package of substantive deliverables. In the nearer future, it goes almost without saying that the December 2013 ministerial meeting in Kyiv should be smooth and businesslike, setting a positive precedent for the years ahead. It is first and foremost a political event, but Ukraine’s technical capabilities and infrastructure will also be under scrutiny. Whether or not Kyiv can shepherd through adoption of significant consensus documents, the summit as a whole will benefit Ukraine’s international standing and its capabilities to build on the largely successful experience of hosting the EURO 2012 soccer championships. The Irish approach in 2012, in contrast, was more surgical, carving out a small handful of top priority issues for attention throughout the year to form the basis of proposals for the Dublin ministerial meeting. Among Ireland’s top goals were media freedom, transparency-focused institution building, and conflict resolution, drawing on best practices from the Northern Ireland peace process.20 At the December 2012 Dublin Ministerial Council, the results of Ireland’s more concentrated agenda proved mixed. While the council supported the Helsinki + 40 roadmap for the OSCE as a Euro-Atlantic and Eurasian security community and backed decisions on counterterrorism and Ireland’s priority of good governance, it could not achieve consensus on any decisions in the human dimension.21 Similarly, while participating states underscored the importance of resolving the protracted conflict in Transnistria, it is unclear that Ireland’s special focus on the lessons of the Northern Ireland settlement has borne fruit for other conflicts in the OSCE space. The best chance for success in Kyiv’s 2013 chairmanship lies in adopting a very ambitious and high-profile agenda animated by a commitment to the basic challenge of building a Euro-Atlantic and Eurasian security community. The best chance for success in Kyiv’s 2013 chairmanship lies in adopting a very ambitious and high-profile agenda animated by a commitment to the basic challenge of building a Euro-Atlantic and Eurasian security community on foundations of enhanced trust in each of the three dimensions. Ambition is key not only because it will mark Ukraine as a leader deserving of the honor and responsibility of chairmanship but also because if Kyiv does not set a serious and compelling agenda of its own, the agenda will undoubtedly be overtaken by Ukraine’s critics, especially on human dimension issues. The agenda must surely be substantive, relevant, and demonstrate continuity with OSCE precedent. But perhaps more importantly, it should be characterized by a single unifying and animating vision that captures Ukraine’s ambition to engage all the tools and resources of the OSCE to fulfill the promise of the Helsinki Final Act. Ukraine’s vision should garner the enthusiastic support of the great majority if not all participating states and should be seen as a shared priority of the entire security community rather than the outgrowth of one country’s national agenda. Through the overarching metaphor of enhanced trust, Ukraine should adopt and advocate for an agenda that builds upon concrete initiatives and short-term progress to advance the long-term vision of bringing the OSCE space together in a fully inclusive and effective security community. As the first of a new troika of non-bloc countries that will lead the OSCE through 2015, it certainly has the status and credibility to make such a vision a reality. These are all worthy aims, laudable for their continuity with long-standing OSCE initiatives. Yet in such a broad agenda, there is a danger of losing track of the big picture—the need to enhance trust among Euro-Atlantic states—while Ukraine’s own commitment to the long-term vision of a Euro-Atlantic and Eurasian security community may be subordinated to short-term battles over individual agenda items. For smaller and more integrated European states, devoting their OSCE chairmanship largely to continuity and maintaining existing momentum may be fine. But for Ukraine, it would be a wasted opportunity. Ukraine cannot afford to put forward an overly broad, vague, or disorganized OSCE agenda. Ukraine cannot afford to put forward an overly broad, vague, or disorganized OSCE agenda. It should focus instead on a small handful of opportunities in each dimension that directly reinforce the vision of a functional, inclusive Euro-Atlantic and Eurasian security community based on mutual trust. Progress toward resolving the region’s protracted conflicts—above all the Transnistria conflict—should be Ukraine’s top priority in the politico-military dimension. As the largest OSCE participating state that is neither a NATO nor a CSTO member, Ukraine has a unique appreciation for the persistent cleavages that prevent states from embracing the vision of a single, cohesive security community. Protracted conflicts like the one in Moldova perpetuate the region’s division and complicate progress on a number of challenges, from revitalizing the region’s conventional arms control regime to combating transnational threats to ensuring reliable access to energy resources. As Moldova’s largest neighbor and a guarantor in the formal, OSCE-led 5+2 process, Ukraine is in a unique position to energize all the interested parties to embrace a common future vision of peace and prosperity. More than anything, this process suffers from a lack of political will for resolution. The basic architecture of a lasting solution is understood by both sides, and it would require significant but feasible investment of outside resources. What has been missing is the resolve of local leaders and outside strategic actors—especially Russia and the European Union, including Moldova’s influential neighbor Romania—to push hard for a solution while refraining from steps that undermine confidence on the other side. Russia has, for instance, linked a possible increase in its military presence in Transnistria to the expansion of NATO missile defense capabilities to include Romania, while Romanian leaders have often provoked Russian and Transnistrian sensitivity by talking about “reunification” with Moldova.26 The Moldovans and Transnistrians, for their parts, are eager to see enhanced regional economic development through integration but are held back by competing integration projects offered by outside powers. Ukraine should urge senior political figures from other OSCE participating states to elevate Transnistria conflict resolution to a top priority. While there should be no illusions that Kyiv can bring the conflict to a final resolution, it is uniquely equipped both to push all sides to undertake confidence-building measures that will create the proper atmosphere for beginning final status negotiations and to ensure that 2013 is a year of consistent forward progress. Specifically, Ukraine should invest its own political capital and call on top political leaders from each stakeholder in the conflict to publicly restate their commitment to a resolution within the 5+2 framework, consistent with Moldova’s sovereignty and territorial integrity, and with appropriate security guarantees for all sides. This will only be possible if President Yanukovych and Foreign Minister Kozhara are personally involved in the process on a regular basis and if they use Ukraine’s elevated status during its OSCE chairmanship year to ask for personal engagement from their foreign counterparts. Ukraine should also push the parties to make maximum progress in the 5+2 working groups aimed at establishing productive cooperation in the spheres of environmental protection, freedom of movement, and education, among others. A key to this is preventing disputed final status issues from derailing working groups’ gradual process of confidence building, which depends in turn on the creativity and resolve of the OSCE mediators, under Ukraine’s leadership, to keep the process going. Additionally, Ukraine should urge senior political figures from other OSCE participating states to elevate Transnistria conflict resolution to a top priority and to do so specifically as a step toward building an inclusive and effective Euro-Atlantic and Eurasian security community. Finally, Transnistria conflict resolution will benefit immensely from the beginning of a regionwide process of historical reconciliation, which fits exceptionally well within the mandate of Kyiv’s OSCE chairmanship. Yet making a new conventional arms control dialogue a priority may prove to be more of a distraction than a benefit for Ukraine’s chairmanship, holding back Kyiv’s effectiveness in the politico-military dimension. Unlike Transnistria conflict resolution, where Ukraine possesses unique interests, expertise, and potential leverage, conventional arms control is a matter largely dependent on the region’s big military powers, namely Russia and NATO. The current deadlock depends on geopolitical factors largely beyond Ukraine’s control. Still, concrete forward progress on resolving the Transnistria conflict could help create political conditions in which the big military powers might return to a productive discussion on conventional arms control. Thus, it seems clear that progress on resolving the protracted Transnistria conflict should be Ukraine’s main focus in this dimension. In the economic realm, Ukraine’s agenda can be expected to include efforts to enhance energy security and efficiency throughout the OSCE space. This is understandable and correct in light of Ukraine’s own pressing interests in reducing tension over gas transit and achieving greater energy independence through efficiency and new energy sources. The OSCE’s economic and environmental dimension has been given limited attention for too long, and a Ukrainian-initiated dialogue on energy security and efficiency can provide critical reinforcement. Ultimately, the success of this endeavor will depend on the details. Kyiv should emphasize the significance of energy efficiency, something that is in its own national interest and also critical for the whole region’s long-term environmental sustainability and human development. Energy security is an important objective, and many participating states will support the idea of an early-warning mechanism for energy issues under the OSCE umbrella. At the same time, some states will continue to see Ukraine as part of the problem, in view of its unresolved gas-pricing dispute with Russia, which has ramifications for downstream states in Central and Western Europe. That means how Kyiv manages its own energy relations with neighbors, especially Russia, will be closely scrutinized. Ukraine must also be careful to ensure that its national interest—including its stated goal to become energy independent by 2030—does not undermine the spirit of cooperative energy security for the region as a whole.29 Just as importantly, Kyiv should emphasize the significance of energy efficiency, something that is in its own national interest and also critical for the whole region’s long-term environmental sustainability and human development. Ireland’s “good governance” initiative in the economic dimension should offer a useful model for Ukraine’s chairmanship. The Irish have emphasized the value of transparency and good governance, seeking to institutionalize these practices among other participating states and offering their own and others’ successful reform processes as examples.30 Enhancing the transparency and effectiveness of state institutions is very much in Ukraine’s national interest, particularly at a time when the country has suffered a resurgent wave of predatory corporate raiding, triggered by changing political power alignments after recent elections, and the enthusiasm of foreign investors has consequently waned. Ukraine can take the lead on fighting corruption by picking up the Irish initiative in 2013 and appointing top international experts to supply guidance as well as by inviting these experts to take on corruption in Ukraine itself as a first-order challenge. The best way for Ukraine to gain instant credibility as a serious voice for economic security through transparency and good governance is to put its own record up for scrutiny and implement expert recommendations on institutional reform at home. The human dimension of security is deeply challenging in Ukraine’s immediate neighborhood and beyond, largely because of lingering tensions over the region’s troubled history, which has bred distrust among the region’s states and societies. Ukraine itself has suffered occupation, annexation, and attempts to obliterate its national identity, but it is not alone in these painful experiences. Ukraine should spearhead an OSCEwide initiative to encourage more active practical historical reconciliation efforts. The president’s question and answer acknowledge the inherent linkages among the central principles of the Helsinki human dimension, reconciliation of long-standing historical grievances, and the prevention of intrastate and interstate conflict. Again, in Yanukovych’s words, the “Ukrainian people are a community for which the respect [for] language, culture, traditions and historical memory of all ethnical minorities is a fundamental basis of life order,” yet “in the sphere of international relations there are challenges that sometimes have historical roots.”37 Intra-Ukrainian distrust and tension is of course linked to wider regional fault lines, but a Ukrainian-led reconciliation effort would make a valuable beginning and offer the potential to engage neighboring communities and other regional states down the road. Thus, Ukraine’s initiative on historical reconciliation should begin with a clear demonstration from Kyiv of the will to support the process within Ukraine as well as with its neighbors to the east and west—especially Russia and Romania. The reconciliation process itself should then draw on the successful experience of other OSCE participating states. Ukraine could call upon all participating states to formally recognize the role of historical grievances as drivers of conflict and establish under OSCE auspices a new, independent repository for documents and best practices related to historical reconciliation as well as a platform for events and dialogue. This could be managed by a new OSCE special representative for historical reconciliation, who might also convene contact groups of national civil society representatives around key conflicts, making a special effort to engage younger people in the process. The Ukrainian chairmanship could further support nascent historical reconciliation processes by inviting respected senior figures from throughout the Euro-Atlantic region to share best practices with their counterparts and even provide guidance for Ukraine’s own reconciliation processes internally and with its neighbors. With such growing enthusiasm in the nongovernmental community in favor of developing and deepening historical reconciliation processes, Ukraine has an invaluable opportunity and a crucial leadership role to play during its OSCE chairmanship. No Euro-Atlantic or Eurasian state is in a better position than Ukraine in 2013 to define in clear and compelling terms the fundamental importance of historical reconciliation for building the trust needed to breathe new life into the Helsinki principles as the basis of a region-wide security community. Putting these ideas into practice will demand political will from all participating states, but it can begin with the Ukrainian chairmanship. Ukrainians can be forgiven for approaching their OSCE chairmanship with some trepidation, since the risks and challenges facing Ukraine and the OSCE region in 2013 are indeed considerable. Some risks stem from the inherent difficulty of balancing among competing interests and ambitions across a broad and diverse geopolitical space, stretching from the Mediterranean to the Arctic and from Vancouver to Vladivostok. Other challenges have to do with Ukraine’s unique circumstances. As a large and important country in Eastern Europe, but one that is still wrestling with its own identity, development and transition from the constraints of its Soviet past, Ukraine will be subject to no small degree of scrutiny and intervention from the outside world as it undertakes a high-profile position of regional leadership. The OSCE is the best institutional embodiment of the vision of a fully inclusive Euro-Atlantic and Eurasian security community that now exists. Yet Ukraine’s OSCE chairmanship will above all represent a major opportunity for Kyiv to define and advance a substantive agenda that can benefit the Euro-Atlantic and Eurasian security community as a whole and Ukraine in particular. To do so, Kyiv will have to marshal a high level of political will and ambition along with considerable institutional resources. If it fails, the agenda will be defined largely by Ukraine’s critics, and the year may create obstacles for Ukraine’s successors Switzerland and Serbia in their attempts to deliver a meaningful and appropriate Helsinki + 40 summit in 2015. Rather than simply continuing the thankless task of juggling initiatives launched and abandoned by past chairs, Ukraine’s chairmanship agenda should identify critical community-wide interests to which Ukraine can bring special capabilities and expertise in all three dimensions. In the politico-military dimension, the highest priority should be building on the current positive momentum in the 5+2 Transnistria conflict resolution process, and seeking to lay the foundations for final status negotiations in the near future. In the economic/environmental dimension, Ukraine should put forward an energy security initiative that balances the present urgent need for an energy transit early warning mechanism with the linked challenges of energy efficiency and environmental protection. Finally, in the human dimension, Ukraine should leverage its own ongoing struggle to enhance social cohesion and inclusive national identity to launch an OSCE-wide platform for historical reconciliation based on best practices and neutral, nonpolitical resources. Ukraine could not have a better platform for pursuing its agenda. The OSCE is the best institutional embodiment of the vision of a fully inclusive Euro-Atlantic and Eurasian security community that now exists. Despite the OSCE’s imperfections, if the participating states tried to rewrite the Helsinki Final Act today, it is doubtful they could do better than the core principles that were memorialized in 1975 and have been reaffirmed in subsequent summits and ministerial meetings. The 2013 OSCE chairmanship offers Kyiv a rare opportunity to advance its own security interests in a way that transcends the usual trade-off of progress in one “vector” for regression in another. Ukraine must seize its golden opportunity to apply ambition, resources, and political will to concrete problems plaguing the security community of which it is an integral part. A lesser effort, or one that harms the OSCE, could leave the community vulnerable to the divisive currents of a dangerous and disordered world and set Ukraine adrift and alone. 1 “Kazakhstan: Nazarbayev Bashes OSCE amid Domestic Tension,” Eurasianet, March 7, 2012, www.eurasianet.org/node/65101. 2 “Kazakhstan’s Practical Approach to Alleviating Humanitarian Crisis in Kyrgyzstan,” OSCE, 2010, www.embkazjp.org/Kazakhstan_OSCE_Kyrgyzstan.doc. 3 Ilya Mouzykantskii, “In Belarus, Just Being Can Prompt an Arrest,” New York Times, July 29, 2011, www.nytimes.com/2011/07/30/world/europe/30belarus.html?_r=3&adxnnl=1&ref=global-home&adxnnlx=1355418173-nbaCpq42yJxjnVi8RVOW1g. 4 “Statement Delivered by the Czech Republic at the OSCE Permanent Council on May 19th, 2011 on Behalf of 14 Countries Invoking the Moscow Mechanism,” U.S. Department of State, May 19, 2012, http://photos.state.gov/libraries/osce/242783/misc_pdfs_2011/MAY_19_11_moscow_mechanism.pdf. The thirteen states joining the Czech Republic were the following: Germany, United States, Canada, Denmark, Finland, United Kingdom, Iceland, Norway, Netherlands, Poland, Romania, Slovakia, and Sweden. 5 “Smoldering Nagorno-Karabakh Conflict Could Re-Erupt,” BBC World News, June 5, 2012, available at http://carnegieendowment.org/2012/06/05/smoldering-nagorno-karabakh-conflict-could-re-erupt/b7zw. 6 “Astana Commemorative Declaration Towards a Security Community,” OSCE, December 3, 2010, www.osce.org/cio/74985?download=true. 7 “Ukrainian Foreign Minister Outlines Country’s Agenda for 2013 OSCE Chairmanship,” OSCE, June 20, 2012, www.osce.org/pc/91461. 8 Senate Resolution 466, “Calling for the Release From Prison of Former Prime Minister of Ukraine Yulia Tymoshenko,” September 19, 2012, http://inhofe.senate.gov/public/index.cfm?FuseAction=Files.View&FileStore_id=26d65aab-4ed1-4173-8f61-c05809c5b0ac. 9 “Coruz Visits Tymoshenko on Eve of OSCE PA Annual Session,” OSCEPA, July 4, 2012, www.oscepa.org/news-a-media/press-releases/1015-coruz-visits-tymoshenko-on-eve-of-osce-pa-annual-session. 10 “Tymoshenko Case: Europe Pressure on Ukraine Intensifies,” BBC News, April 30, 2012, www.bbc.co.uk/news/world-europe-17892514. 11 ODIHR, OSCE Parliamentary Assembly, Council of Europe, European Parliament, and NATO Parliamentary Assembly, “International Election Observation Mission to Ukraine; Statement of Preliminary Findings and Conclusions,” October 29, 2012, www.osce.org/odihr/96675. 12 “The people of Ukraine deserve so much better,” [Secretary of State] Clinton said. “They deserve to live in a country with strong democratic institutions that respect the rule of law. And these elections did not advance those goals.” Scott Stearns, “Ukraine Vote a Step Backwards for Democracy, Says Clinton,” Voice of America News, October 30, 2012, www.voanews.com/content/clinton-ukraine-vore/1536141.html. 13 Although the 2010 Kharkiv agreement deferred an acute conflict between Ukraine and Russia over the Russian naval base in Sevastopol, the issue was brought to a head during the 2008 Georgia war, when then-President Yushchenko threatened to blockade Russian warships in port, and it remains a political time bomb in view of Crimea’s largely pro-Russian population. Anders Aslund, “Crimea and Punishment,” ForeignPolicy.com, January/February 2010, www.foreignpolicy.com/articles/2010/01/04/crimea_and_punishment. 14 “Russia, Ukraine Agree on Maritime Border Delimitation,” RIA Novosti, July 13, 2012, http://en.rian.ru/russia/20120713/174576071.html. 15 “Ukraine Corporate Raids Stifle Foreign Investment,” Fox News, May 27, 2012, www.foxnews.com/world/2012/05/27/ukraine-corporate-raids-stifle-foreign-investment. 16 “Cautious Comments Deter Budget Deal Hopes,” Irish Times, November 23, 2012, www.irishtimes.com/newspaper/world/2012/1123/1224327012095.html. 17 Interview with Paul Fritch, former chief of staff to the OSCE Secretary General, November 2012. 18 Roman Yakovlevsky, “Lithuania Prepares to Pass the OSCE Exam,” European Dialogue, November 30, 2011, http://eurodialogue.org/Lithuania-Prepares-to-Pass-the-OSCE-Exam. 19 “Eighteenth Meeting of the Ministerial Council 6 and 7 December 2011,” OSCE, December 7, 2011, www.osce.org/mc/88839?download=true. 20 “Address by the OSCE Chairperson-in-Office, Tánaiste and Minister for Foreign Affairs and Trade, Eamon Gilmore T. D., to the 21st Annual Session of the OSCE Parliamentary Assembly,” OSCE, July 5, 2012, www.osce.org/cio/92288. 21 “Ministers Agree Helsinki +40 Road Map for OSCE, Declare Support for Transdniestrian Settlement Process as Dublin Ministerial Council Ends,” OSCE, December 7, 2011, www.osce.org/cio/97954 . 22 Foreign Ministry of Ukraine, “Minister for Foreign Affairs of Ukraine Kostyantyn Gryshchenko Outlines Priorities of Ukraine’s OSCE Chairmanship 2013,” www.mfa.gov.ua/mfa/en/news/detail/83596.htm. 23 “Filat, Shevchuk to Mount Athos to Pray at Old Monasteries,” Interfax, July 16, 2012, www.interfax-religion.com/?act=news&div=9520. 24 Judy Dempsey, “Challenging Russia to Fix a Frozen Feud,” New York Times, October 27, 2010, www.nytimes.com/2010/10/28/world/europe/28iht-letter.html?_r=0; Stefan Meister, “A New Start for Russian-EU Security Policy? The Weimar Triangle, Russia and the EU’s Eastern Neighborhood,” Eastern Partnership Community, September 5, 2011, www.easternpartnership.org/publication/security/2011-09-05/new-start-russian-eu-security-policy-weimar-triangle-russia-and-eu-s.
25 “Statement on the Negotiations on the Transdniestrian Settlement Process in the “5+2”Format,” OSCE, December 7, 2011, www.osce.org/mc/97976. 26 “Basescu Plan: Actions Supporting Unification With Romania Held in Chisinau,” Regnum, October 30, 2006, www.regnum.ru/english/730646.html; “Transnistria Next Missile Defense Flashpoint,” Weekly Standard, February 16, 2010, www.weeklystandard.com/blogs/transnistria-next-missile-defense-flashpoint. 27 “Address to the Permanent Council of the Organization for Security and Co-operation in Europe by Minister for Foreign Affairs of Ukraine H. E. Mr. Kostyantyn Gryshchenko,” OSCE, June 20, 2012, www.osce.org/pc/91565. 28 Ulrich Kühn, “From Capitol Hill to Istanbul: The Origins of the Current CFE Deadlock,” Institute for Peace Research and Security Policy at the University of Hamburg, December 2009. 29 Ministry of Energy and Coal Industry of Ukraine, “Energy Strategy of Ukraine 2006–2030,” http://mpe.kmu.gov.ua/fuel/control/uk/doccatalog/list?currDir=50505. 30 “Address by Mr. Eamon Gilmore T.D., Chairperson-in-Office of the OSCE, Tánaiste and Minister for Foreign Affairs and Trade to the Permanent Council,” OSCE, January 12, 2012, www.osce.org/cio/86962. 31 “U.S.-Ukraine Strategic Partnership,” Carnegie-IWP Conference, February 14–15, 2012. Summaries available at http://iwp.org.ua/eng/public/322.html and http://carnegieendowment.org/2011/02/14/ukrainian-foreign-minister-on-u.s.-ukrainian-relations/bjo. 32 “Yanukovych: Inactivity, Corrupt Officials Major Obstacles to Implementation of Reforms in Ukraine,” Kyiv Post, July 3, 2012, www.kyivpost.com/content/ukraine/yanukovych-inactivity-corrupt-officials-major-obst-309245.html. 33 Euro-Atlantic Security Initiative (EASI), “Historical Reconciliation and Protracted Conflicts,” February 2012, http://carnegieendowment.org/2012/02/03/historical-reconciliation-and-protracted-conflicts. 34 Helsinki Final Act, “Questions Relating to Security in Europe,” Section 2, www.osce.org/mc/39501. 35 This is particularly problematic in those Eastern European societies that have come to depend on the narrative of “double occupation” to explain the World War II and Communist period of their history—too often as a red herring to avoid grappling with more complex stories of collaboration and perpetration. 36 President of Ukraine, “President: Political Radicalism Must Be Stopped,” June 3, 2011, www.president.gov.ua/en/news/20286.html. 37 President of Ukraine, “Viktor Yanukovych: Ukraine Has Good Traditions of Coexistence of Different Confessions and Nationalities,” October 1, 2012, www.president.gov.ua/en/news/25597.html . 40 Wolfgang Zellner, Yves Boyer, Frank Evers, Isabelle Facon, Camille Grand, Ulrich Kühn, Łukasz Kulesa, Andrei Zagorski, “Towards a Euro-Atlantic and Eurasian Security Community,” Hamburg, Paris, Moscow, Warsaw 2012, 20, http://ideas-network.com/fileadmin/user_ideas-network/documents/IDEAS%20Report%20October%202012.pdf.